Look, let’s not beat around the bush, I love doing my nails. But man, I am totally enjoying the Mani Monday with Essence series! I now have a legit reason to paint my nails regularly! Heehee! If you’re not in on the news, Essence is giving away fabulous nail polish and nail art goodies to one beautiful MSB reader, to celebrate Women’s Month. To enter, check out all the Mani Monday posts (just click on “Nail Art” on the top tool bar) and follow the rafflecopter below. Right, now that all the formalities are out of the way, let me begin to profess my undying love for this weeks color. Aaack! I’m a fan! 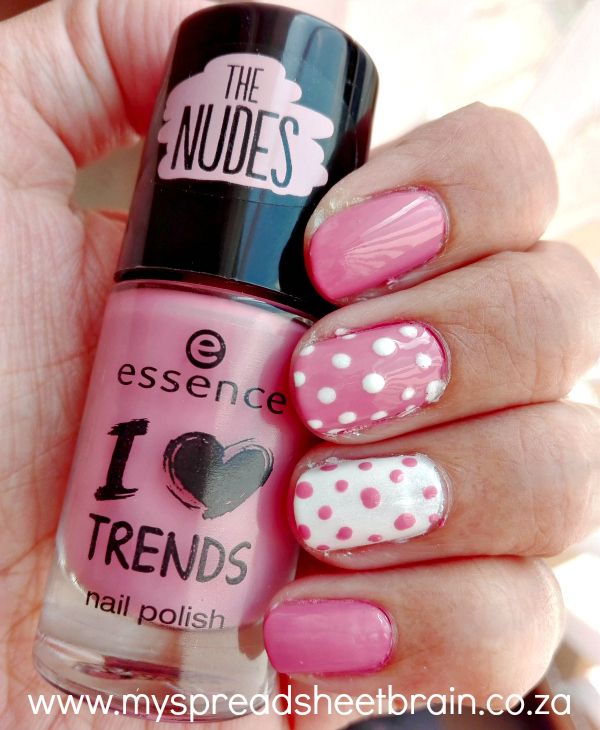 This pretty pink Essence “I love trends” #07 called ‘Hope for love‘, has totally stolen my heart! The shade is a light berry, pink paint and can be found in The Nudes range. Armed with a bunch of stickers, my nail art stamps and striping tape, I could not figure out how to dolly this mani up. And then I remembered last week’s star: The Pastels #13 ‘Ice to meet you‘. The 2 totally compliment each other! It just made sense to revert back to my favorite nail art: polka dots! I think that the result is pretty sweet and so fitting for Women’s Month. You probably get various high profesh nail art tools that you could use for dotting, but I prefer using a hair grip to make my dots. You simply dip the end of the grip into your paint, and lightly apply to your nail, to create perfect polka dots. Easy peasy! I tried to take another pic to once again show how amazingly shimmery the ‘Ice to meet you’ color is. It’s a beaut! Would you try this at home? You could… and you should! Pick up a couple of Essence polishes from your nearest Dischem or Clicks stores and give it a go! Oh and while you’re at it, enter our shweet giveaway below. Don’t forget that you get extra points by commenting on each Mani Monday post, this month. Once you’ve commented, simply hit the “Leave a blog post comment” prompt, on the rafflecopter, and Bob’s your uncle. Well, not really. But you know what I mean. I’m totally going to show this to my husband so that he can dot my nails! I mean, that’s what they are there for, right? My favourite thing is even though there are two dotted nails next to each other it doesn’t look overdone! Me too! Totally love the understated look! Dotticure are an easy, but yet an elegant and never out of date manicure! I like to wear lighter shades, especially in Summer and the name of “hope for love” so so for me! Like you describe it berry light pink and i so LOVE my berry fruits – i’m so going to check this one out at Clicks! It’s a simple yet beautiful way to design our manicures with essence! Beautiful, they do have such gorgeous make up items! My favourite is how even though I’m not a pink fan, this look is understated yet girly enough for anyone to pull off. I love the polka dots and how the 2 colours compliment each other so well.